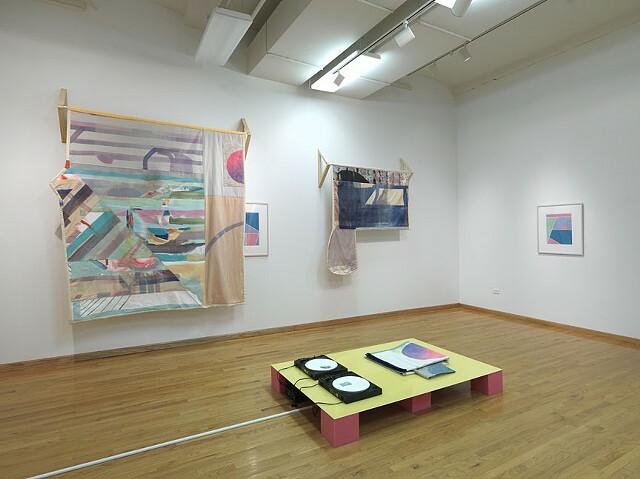 On view at the Center for Book & Paper Arts, Columbia College Chicago. Organized by Julia V. Hendrickson. 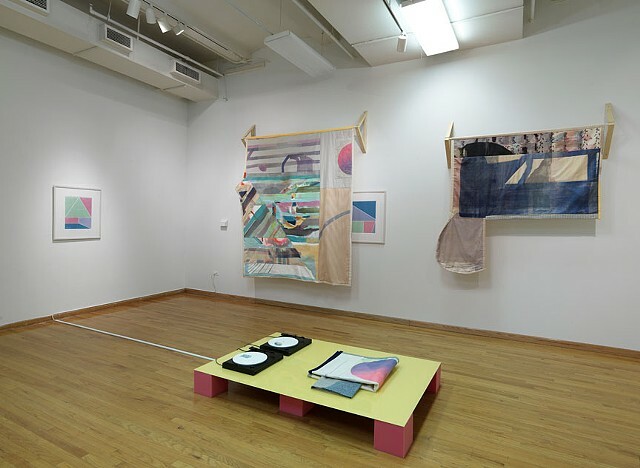 Starting from similar places of reference—as screen printers who force ink on to paper through a finely-woven mesh—the Chicago-based duo Sonnenzimmer (Nick Butcher and Nadine Nakanishi) and the Montréal-based duo Seripop (Yannick Desranleau and Chloe Lum) have independently developed bodies of work wherein they investigate, as printmakers, the relationship between the materials of fabric and paper. 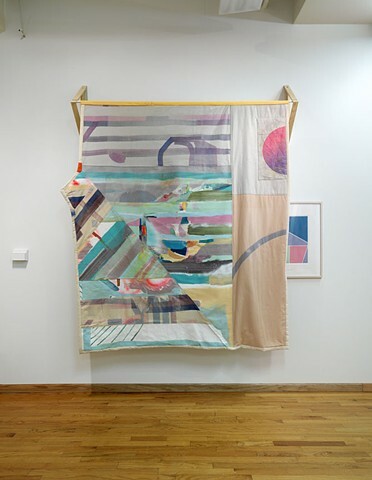 Sonnenzimmer translates their own peaceful, complex language of abstract design on to new surfaces, imbuing linen and canvas with vibrant systems of overlaid shapes. 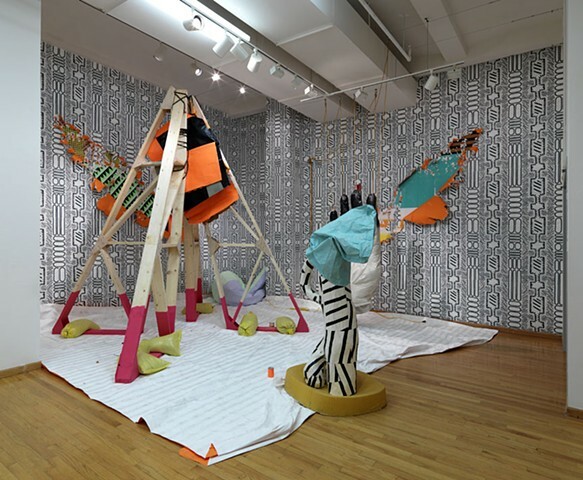 Seripop’s monumental screen printed paper installations subvert expectations of the possibilities inherent in a single material. 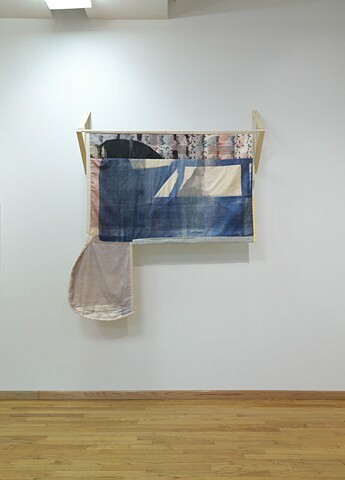 Whereas Sonnenzimmer typically investigates fabric as if it were a kind of paper (shaping, painting, and printing on it as a wall-hanging or floor piece), Seripop often creates large-scale installations that utilize paper as if it were fabric (draping and folding massive sheets with a casualness that belies the fragility of the medium). The same thought process exists—to treat one material as if it were another—but with opposite and wildly varying results. 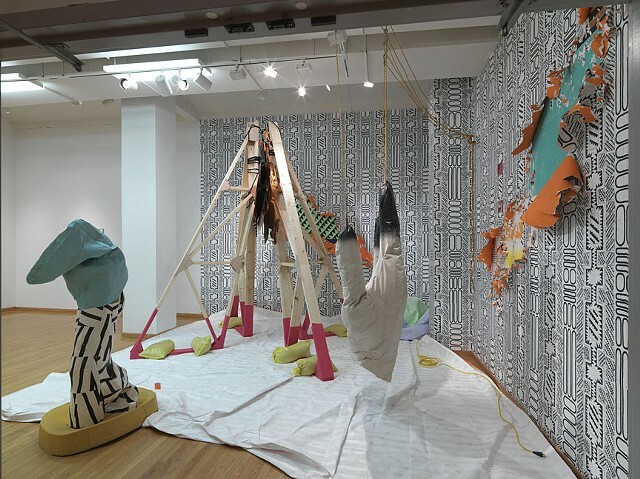 Simultaneous will consist of dual large-scale installations in the Center for Book and Paper Arts galleries. 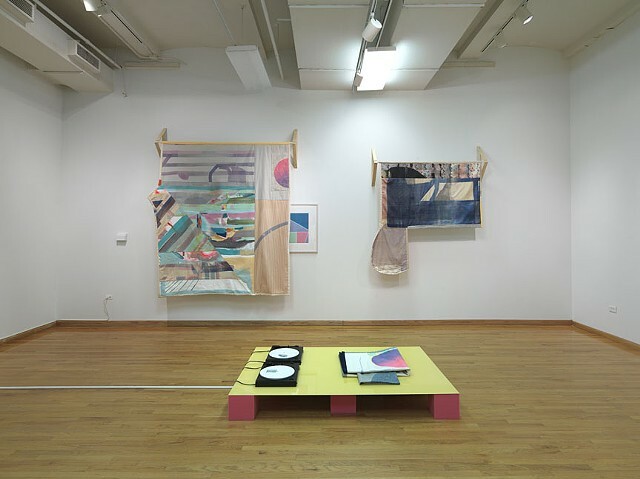 Creating the work separately in their respective cities, but in rich dialogue with each other, Simultaneous will include a range of printed paper and fabric works, including textiles, wall-hangings, paper sculptures, posters, as well as audio elements. 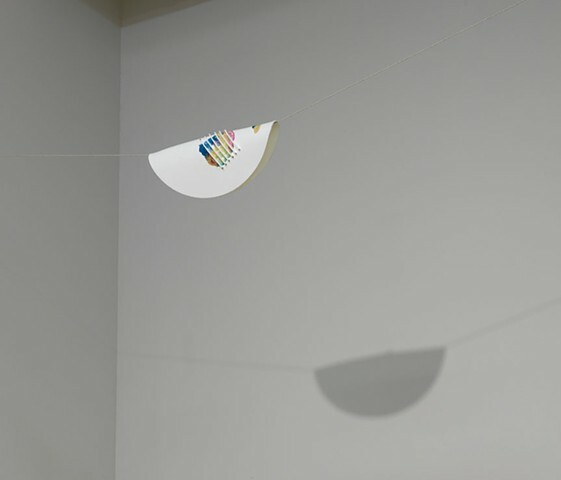 Simultaneous is curated by Julia V. Hendrickson, an independent curator, editor, and writer who lives in Austin, Texas. A limited-edition screen printed poster as well as a full-color, 40-page catalog (with essays by Julia V. Hendrickson and Lauren Weinberg) will accompany the exhibition. 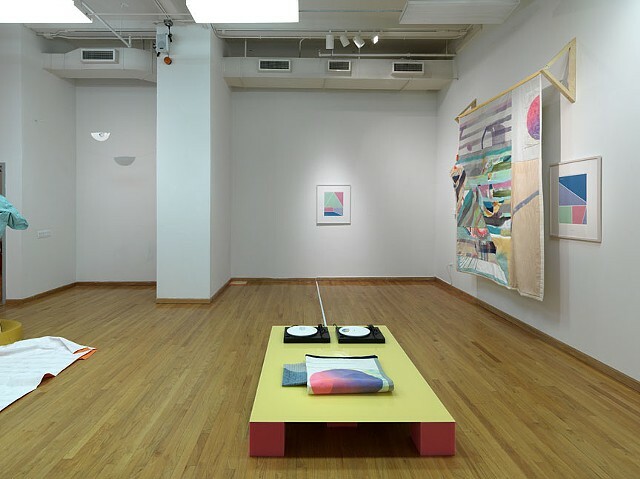 Support provided in part by the Canada Council for the Arts; the Center for Book and Paper Arts at Columbia College Chicago; the Conseil des arts et des lettres du Québec; the Illinois Arts Council; the Québec Government Office in Chicago; and Skyline Design, Chicago. A PDF of the exhibition catalogue can be found here. Picard, Caroline. 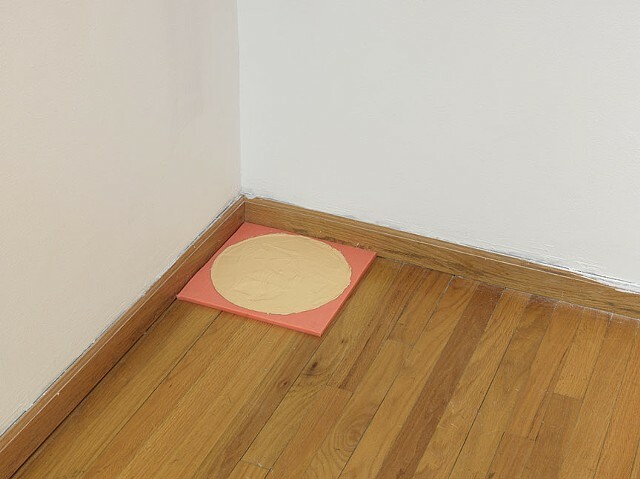 |http://theseenjournal.org/art-seen-chicago/simultaneous-seripop-sonnenzimmer/ |“Composing Landscapes.”| The Seen. April 7, 2015. Barash, Philip. 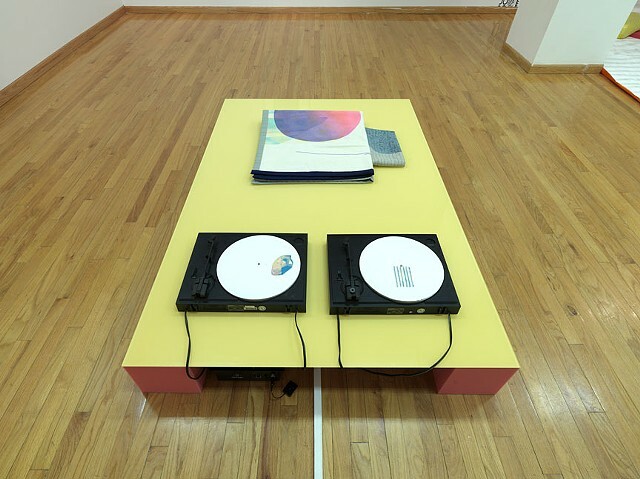 “Review: Simultaneous: Seripop & Sonnenzimmer/Columbia College Center for Book and Paper Arts.” Newcity. February 19, 2015.